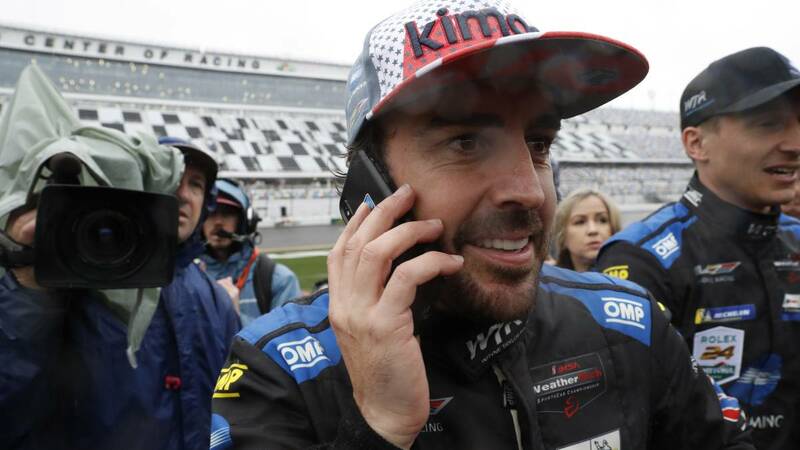 Home Moto "I do not need to vindicate myself"
"I do not need to vindicate myself"
Fernando Alonso, flamboyant winner of 24H Daytona, talks with As of past, present and future: his victory, Le Mans, F1 and even the Dakar. Fernando Alonso, with that mixture of happiness and tiredness. Grateful, salute, joke, speak first before the international press and then answer As's questions. He tells us about his victory, Le Mans, F1 and even the Dakar. -How is this new Fernando Alonso doing? -The truth is that I'm very busy and with a lot of work, in these last months I've had a lot to do and what we have left. Since February we are going again with Toyota to the WEC and then it's time to prepare Indianapolis. Until June I have everything quite busy and even beyond. I'm going to have to go back to Formula 1 to rest. -As for Daytona, the race was spectacular, but the rain got a little bit tarnished, maybe. -Well, actually there were some very complicated conditions, very difficult. From five in the morning it was raining very hard, there were puddles in many parts of the circuit. But we were leaders by day, by night, with water, in the dry ... we could say that we deserved the victory. -Yes, here It was clear that I had to go with Cadillac, here the Cadillac win, it's a circuit for the characteristics of that car and it was one of the ideas that I always had clear, try that assault with Cadillac. -In less than a year has won the 24 Hours of Le Mans and the 24 Hours of Daytona. What does it mean in your career as an athlete? -It's unthinkable if I look back and stop to think. After so many years in Formula 1, try adventures outside of it in historical races, very important in the motor world, starting with the 500 Miles of Indianapolis in 2017 and then with Le Mans and now Daytona. I would never have said that I was going to achieve it because I do not have the necessary experience in Resistance as some of our great rivals who were on the track do. I was lucky to be at the right time and in the right place, at Le Mans with Toyota and here with Cadillac, and to do two good races and take two trophies home that a year and a half ago I would not have imagined. - What is the Resistance that is so good? -I feel comfortable, there are things like traffic, how you handle it, how you try to anticipate overtaking, bent, that bother you in the least harmful site for the weather. turn ... Or the preparation itself, since you spend two or three hours in the car and then you do not have fifteen days to rest like in F1, but you have only three or four hours already track again. I think all that adapts to my desire, to my constant struggle and in the Resistance races I have a good time. And that's important. -This victory is one more step in his stated goal several times to be considered the best, the most complete rider in history. -Actually I think everyone will always have their opinion on Who's the best. For example, in F1 you need to always have conditions, a symbiosis with the car, with luck, with the year to win. If you have it you can be a world champion and if you do not have it, it is impossible, and in other engine categories it depends a bit more on yourself and for having won in Valencia or Barcelona, but also Suzuka or Malaysia, with different cars; in Le Mans, Daytona ... they are prestigious names and they make me very proud and be one of the most complete pilots in the world. -There is talk of more disciplines, once we have As in their querencia for rallies. ..
-I've never tried and I'm more asphalt driver, but I do not rule it out either. In the end I tried many cars, I got to try a MotoGP in my time at McLaren Honda. For trying, I like to try everything, but after running and being competitive in something ... that is much more difficult than it seems. It seems easy from the outside because we have done it in recent years, but it requires a very large preparation and specialization. -Let's leave doubts, will the 2020 Dakar run? -I have nothing decided or anything thought about that . -Maybe I'll try the car as I tried the Nascar, the MotoGP, as I try everything I can because I like it, but then to when deciding to run something with a lot of prestige and a lot of difficulty you have to be sure of being able to do it well and I'm not sure about that today. -Le Mans, Daytona, legendary names. Is this a claim of Alonso as a pilot or did not need it? -I think I do not need to claim, right? Last year, withoutr further, no F1 driver had previously made a 21-0 qualifying to his teammate. In every race I've done in recent years, regardless of the results, I think that everyone has seen that I am in the best moment of my career, both in F1 and in any other car I climb. -Thanks always to you and the readers of As.